German Shepherd vs Labrador? The ultimate conundrum! They are both quite different personalities, but equally appealing in their own unique ways. But don’t worry, we’re here to help! We’ve broken down the similarities and differences between these two gorgeous breeds. Helping you to decide whether a Lab or German Shepherd is the right dog for you. Find Lab vs GSD health, temperament, training, grooming, lifespan, and so much more. The German Shepherd vs Labrador debate involves the two most popular pet dogs in the US, year after year. For the past 26 years, the Labrador Retriever has kept the number one spot all sewn up. The German Shepherd is hot on its heels in the number two position. Without a doubt, either the German Shepherd or Labrador Retriever is a great choice for a companion canine. You simply can’t go wrong by choosing a well-bred, healthy and happy dog from either breed! However, which breed is a better choice for your life, daily schedule, and what you have to offer a pet dog right now? There are some important differences that can help you. The German Shepherd dog is a large size dog with a medium energy level. This means that the German Shepherd will thrive with focused and energetic activity, such as play time and daily walks, but then will look forward to nice rests in between, including naps and a long evening snooze. Conversely, the Labrador Retriever is a medium size dog with a high energy level. The Lab needs lots of daily interaction, playtime and walks (or runs or swims or all of the above) to stay happy and healthy. Naps are lower priority. This can mean a more demanding pet dog to care for, at least in the puppy to mid-adult years. This difference, and others we will cover here, can mean one breed may fit in better in your daily life. The German Shepherd is classified as a “large breed dog” and the Labrador Retrieveris classified as a “medium breed dog.” However, can see by the statistics that there isn’t a huge difference in height or weight between the two breeds. Height: 22 to 26 inches (adult males average 2 inches taller than adult females). Weight: 65 to 90 pounds (adult male); 50 to 70 pounds (adult female). Height: 21.5 to 24.5 inches (adult males average 1 inch taller than adult females). Weight: 65 to 80 pounds (adult male); 55 to 70 pounds (adult female). From a pure height and weight comparison, you probably won’t find much useful information to help you decide between a GSD vs Labrador. However, it is good to know the potential full adult height and weight of both dog breeds before you commit to either! 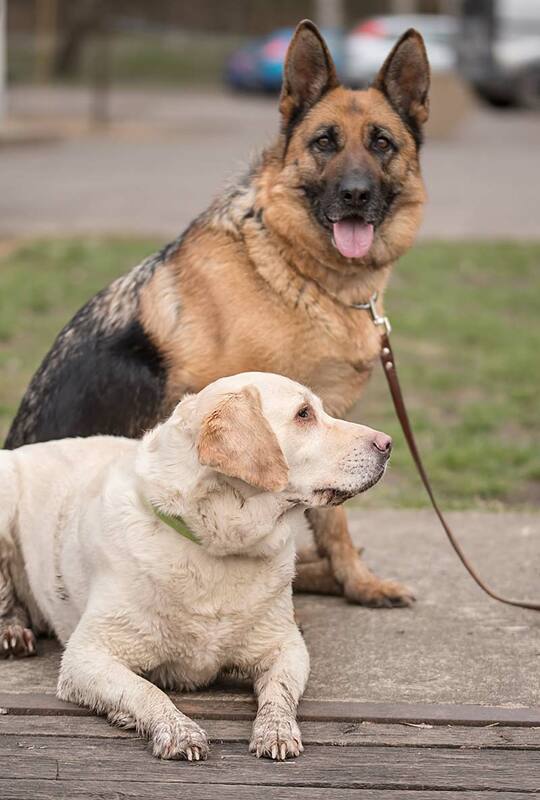 Both the Lab and the German Shepherd are very good-looking canines! However, their overall appearances and demeanors are generally considered quite different. 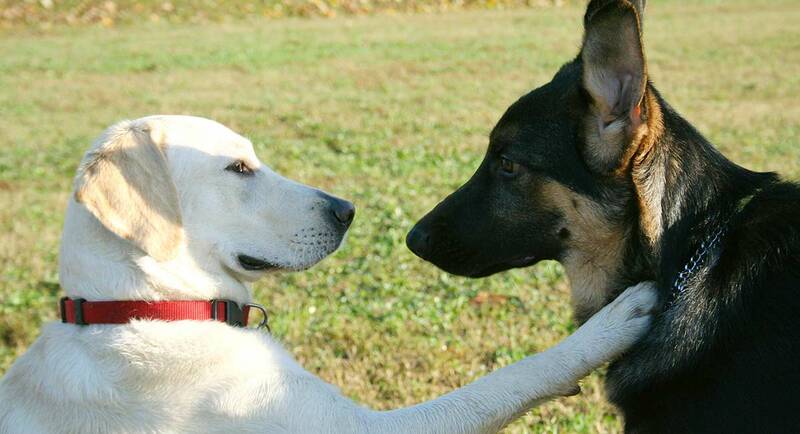 The German Shepherd is a master of calm confidence. From his alert upraised ears to his perfectly positioned paws, somehow a GSD still looks well-put-together even after a scramble through the brush or a dip in the lake! One unmistakable trait that sets German Shepherd dogs apart is their erect posture. They simply appear incapable of slouching! This dog’s body is quite long, and is lean and rangy despite the thick two-layer coat and bushy tail. If you’ve ever seen an athlete who simply knows he is fast, agile and strong, this may remind you of a German Shepherd. This dog knows his strengths and isn’t afraid to use them. In fact, the composed demeanor is part of what makes the German Shepherd such a great working dog. German Shepherds can have many different coat colors, from light tan and gray to deep, rich browns with black accents. The black and tan coat color is the best-known combination for this breed. After your first sight of a Labrador Retriever, you likely came away with an image of this dog’s eager, friendly face and eyes. The face of a Lab often seems to be smiling simply for the sheer joy of being alive! The Lab is a strong, solid dog, and perfectly capable of looking the part of a perfect show dog. However, this breed’s natural eagerness and enthusiasm for life typically results in a less polished daily appearance! The Lab is the most beloved pet dog in the US for the 26th year in a row for a reason. These are dogs that can make the bleakest day feel sunny and full of fun. Overall, the Labrador’s body is typically described as solid yet not stocky. The coat is short, double-layer and waterproof, with an amazing “otter-like” tail that is made for swimming. Labradors today are usually characterised as yellow Labradors, black Labradors or chocolate (brown) Labradors. Interestingly, if you are trying to decide between a black Lab vs German Shepherd, there is a newer GSD line with an all-black coat. They are really beautiful dogs! Blowing coat, shedding, molting. These are just a few of the terms commonly used by German Shepherd and Labrador lovers alike to describe their daily battles with their pets’ hair. The truth is, both of these breeds tend to shed more rather than less, and more often rather than occasionally. In other words, if you are searching for a “hypo-allergenic” breed that won’t trigger your pet dander allergies, neither of these is an ideal pick! Let’s take a look at some subtler differences between the shedding and grooming needs of the German Shepherd vs Labrador. Part of what the German Shepherd dog is so well known for is their thick and luxurious coats. While this makes for a striking show dog and is certainly warm and cozy, it isn’t always fun for the owner! After all, someone has to sweep or vacuum up all that shed dog hair! Moreover, German Shepherds don’t just shed seasonally, although they do tend to shed more during their biologically-mandated semi-annual coat change. However, German Shepherds shed every day. Part of the reason is that these dogs have a longer and very thick outer coat layer, and an equally thick shorter insulating under-coat layer. Both layers have to continually shed out old hair and grow in new hair as nature dictates. Unless you enjoy living in a sea of dog hair, you should brush your German Shepherd at least three times per week, with one more intensive grooming session weekly. It may also be wise to invest in a heavy-duty vacuum cleaner. To learn more about German Shepherd coats, we recommend this informative post. To put it simply: Labradors shed. They shed morning, noon and night, in the summer and in the winter. Labs do tend to shed more heavily during seasonal coat changes (called “molting”), but there is no time of year when they will be “finished” shedding. Shedding is a year-round affair. A big part of the reason for this is because the Lab has a two-layer coat. The top layer is thick and waterproof. The bottom layer is short and thick to serve as insulation for these water-loving dogs. Both layers need to shed regularly to stay effective in their jobs. This applies whether or not your Lab is actually swimming in the icy lake waters like her ancestors did! So that’s the bad news. Your Lab is going to shed, and there really isn’t anything you can do about it. However, other Lab lovers have been working to tackle the shedding problem for decades. You can find advice on how to cope effectively with your Labrador’s shedding here. Ultimately, if you choose to share your life with a Lab of any color, you will need to commit to near-daily brushing and weekly grooming (not to mention house and car cleaning) to keep your Labrador’s shedding hair under control. There isn’t a dog breed on this planet that could hit numbers one and two, respectively, on the American Kennel Club’s “most popular pet dog” list year after year without having a pretty stellar temperament! Whether you select a GSD or Lab for your next pet dog, you will get a dog that has literally been bred to love and stay loyal to you and your family. Both dogs will also be equally eager to please you, which can make training much easier. In the Labrador vs German Shepherd intelligence debate, both dogs score equally as high. However, their intelligence often manifests in different ways based on their unique temperaments. While both dogs are highly popular pet dogs and have everything going for them, there are a few caveats to keep in mind. These might make it easier for you to decide on a Lab vs German Shepherd for your next dog. If you looking for a true guard dog for your family, the German Shepherd is the one for you. German Shepherds have distinguished themselves in practically every type of service job, from combat military to Secret Service to police work to personal service animals. A great deal of the reason for this is due to the traditional German Shepherd guarding behavior. German Shepherd dogs are naturally inclined to bond strongly with the individual they regard as their main carer or trainer. They will be intensely motivated to obey and guard that person. As a family dog, the German Shepherd will extend those same qualities to your entire family, including young children. This includes, with careful training, other family pets. However, a GSD’s guarding behavior can get her in trouble with non-family members, strangers and unknown animals, including the neighbor’s pets. With these individuals, a German Shepherd can be stand-offish, reserved, and occasionally hostile. Training and plenty of exercise and playtime are essential to keep your German Shepherd happily engaged in “work,” which this dog breed is genetically wired for. It will moderate any boredom-based behaviors that may come across as aggression. If there is one trait you won’t usually have to worry about in your Labrador Retriever dog, it is standoffishness. These dogs tend to love anyone. If we’re honest, a little too much on occasions! It is important to know that Labs typically stay puppy-like in their behavior for around three years. This can be less true with the American “working Labs” than for their English “show Lab” cousins, as this informative article highlights. Labs are also intensely food-driven, and researchers have found a possible genetic explanation. Apparently, many Labs are born with a small bit of DNA missing in a gene called POMC. This tiny but significant gene is responsible for letting Labs know when they feel full after a meal. Otherwise, Labs tend to be high energy from puppyhood through the middle adult years, gradually becoming more laid-back with age. Training will be essential to keep this quintessential working dog mentally and physically fulfilled and help the pounds stay off! Both German Shepherds and Labrador Retrievers are dual-purpose canines: they are bred for show and bred to work. Both breeds are purebreds with lineages that extend back to the earliest days of canine clubs. This is good news if you are looking for purebred Labrador or German Shepherd puppies with the temperament and personality to make great show dogs, working dogs or pet dogs. However, in terms of health, the news isn’t quite so great. As you compare the German Shepherd vs Labrador, you will notice each purebred line has certain notable health issues. This is quite common in purebred dog breeds and something to be aware of when selecting your next pet dog! 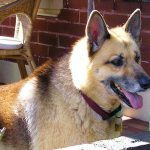 German Shepherds tend towards issues with hip and elbow dysplasia, degenerative myelopathy (affects hind quarters), heart conditions, bloat, and certain eye conditions. One newer health concern that has also arisen in the purebred German Shepherd line is back problems. These stem from intentionally breeding dogs for a slope in the back, which can cause difficulty and pain when walking. The Canine Health Information Center maintains a list of available genetic tests you can order to rule out serious health concerns when picking out a German Shepherd puppy. Labs are particularly predisposed to dysplasia of the hip and elbow, as well as certain eye and heart issues. Excitingly, researchers have just recently discovered the gene responsible for one known Labrador health issue, exercise-induced collapse (EIC). This plagues young adult Labs in particular. 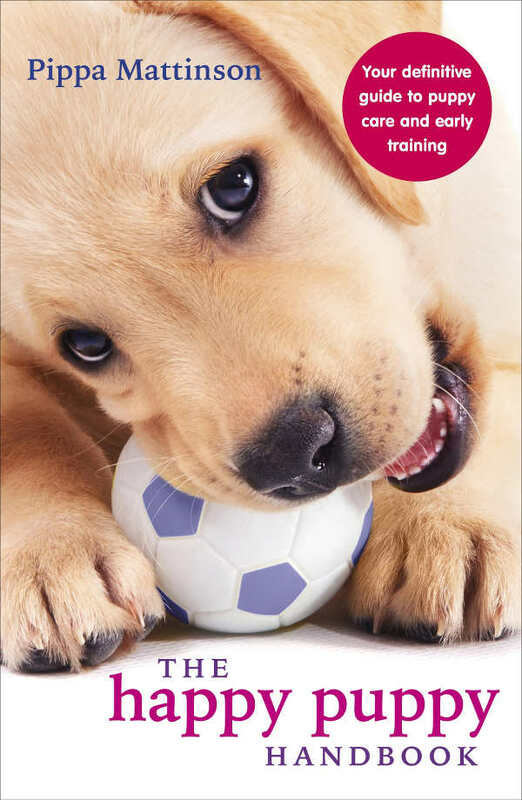 The Canine Health Information Center maintains a list of available genetic tests you can order to rule out serious health concerns when picking out a Lab puppy. Have you made up your mind about whether to choose a German Shepherd vs Labrador puppy? We hope you have found this side-by-side comparison of both dog breeds helpful in your decision-making process! When you decide, we would love to hear your story of how you chose your new puppy! Recently lost my shepard girl who was 14 yrsrs old.. now looking to find another must be over puppy stage. How much is a German Shepherd Dog – What can you expect to pay? American German Shepherd Dog – Is This Dog Right For You? German Shepherd Temperament – Great Guard Dog or Perfect Pet? Miniature German Shepherd – Your Favorite Dog In A Tiny Package!